There's just no better way to punctuate a sunshiney day than with a backyard grill-out. Char marks are particularly delicious April through October when long spring, summer, and fall days melt into crisp nights. We designed the trio of doctored-up links below with backyards and char marks in mind. In Cincinnati, we head to Findlay Market for specialty sausages, crusty breads, and interesting toppings. You should hit up your own neighborhood bakeries, markets, and meat shops for local inspiration where you live. Use the recipes and pictures here simply as a starting point -- tailor them to the treasures you find the next sunshiney day. 1. Prep your ingredients: Thinly slice the onion and bell pepper. Drain the capers and soak the raisins in the vinegar. 2. In a sauté pan combine a couple tablespoons of olive oil, the onion, and bell pepper. Turn to medium-high heat and cook until the vegetables are tender and caramelized. 3. As the onion and pepper cook, grill the sausages and cut the baguettes into pieces as long as the links. Halve the hunks of bread, keeping a spine of crust intact. 4. Once the onions are golden brown, add the raisins, vinegar, and capers, and cook until the vinegar has reduced by half. Season to taste with salt and pepper and remove from the heat. 5. 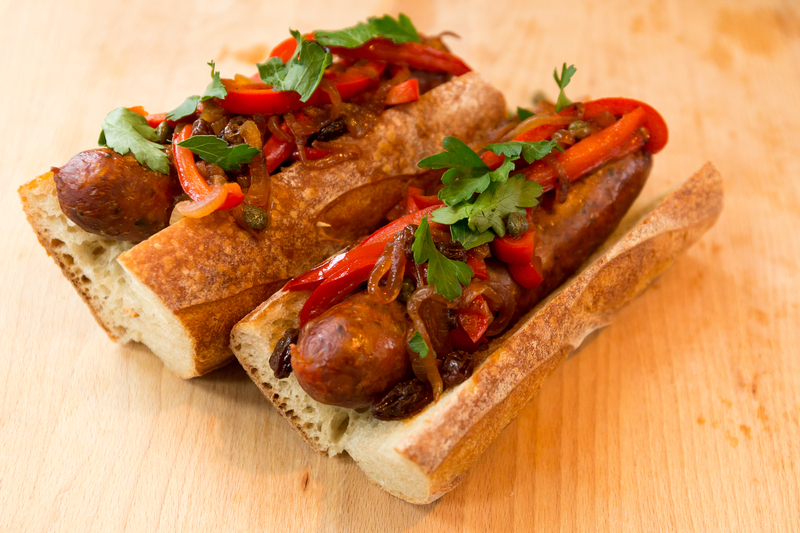 Assemble the sausages and bread, top with the hot gastrique, and finish with a healthy tear of fresh parsley leaves. **The sweetness of the raisins, the bite of the vinegar, and the saltiness of the capers complement the heat of the chorizo; the parsley brightens the total experience. **Save any leftovers of the gastrique to top a grilled steak, breast of chicken, or layer on a sandwich with a fatty, rich cheese.